I have been so busy planning and executing Christmas Bird Counts, that I am behind on a few blog posts. One that could no longer be delayed is the annual or should I say semi-annual (I might have missed one or two) posts covering birding highlights of the year. With two trips to Asia in 2015 you could bet that some of those birds will be on this list so without further ado this is my top ten. 10. Two overwintering Baltimore Orioles in my backyard how could they not make my top 10. 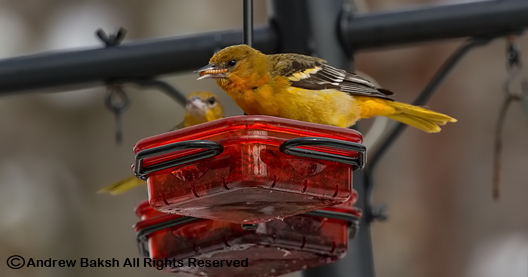 These two Baltimore Orioles stayed all winter and I kept them fed and happy throughout those cold days. They departed sometime after mid April as the weather got warmer. Surely this experience deserved a top ten mention. A blog post with photos and video was published on March 21st 2015. If you missed it, here is the link. Nothing says Spring migration is on like a Yellow-throated Warbler. These sweet looking warblers are starting to become a yearly thing with the possibility of breeding occurring on Long Island NY. A sure sign of more southern species expanding their range. 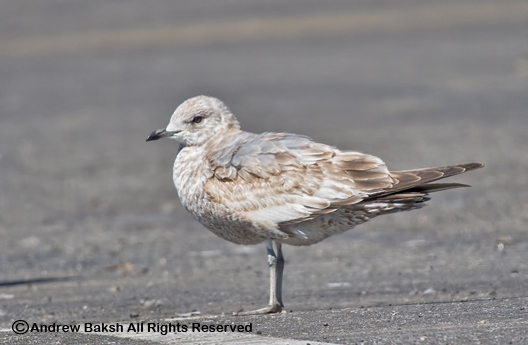 Shane Blodgett who puts in a lot of Gull work found yet another Mew Gull in Brooklyn NY. This time it was Larus canus brachyrhynchus the NA subspecies of Mew Gull. I had crippling views of this bird the second time I went looking for it...ironically to help a friend who never showed up. I am on the hunt for one in my home county of Queens so study time with this bird was of utmost importance. A definite top 10. 7. South Polar Skua NY overnight Pelagic with See Life Paulagics. I finally fulfilled a goal of mine to yell "SKUA" at the top of my lungs on an overnight See Life Paulagics on June 1st. 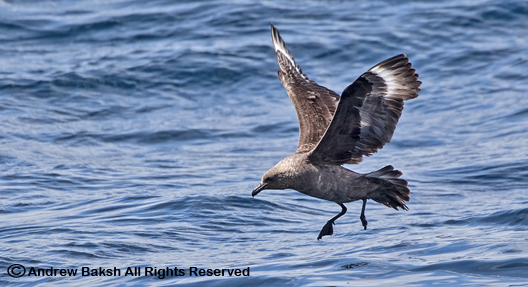 If you have not yet ventured out on a NY Pelagic, I highly recommend See Life Paulagics. Operated by Paul and Anita Guris who are both super nice and knowledgeable (they did not pay me to say this). You cannot go wrong in their capable hands. The line up of leaders include some of NY's finest birders. You can't miss Paul with his often beaming smile and teaching mode on full. Just don't bring any bananas on-board or you might be used as "chum." 6. Nothing, I repeat Nothing brings me such joy like a flock of shorebirds! 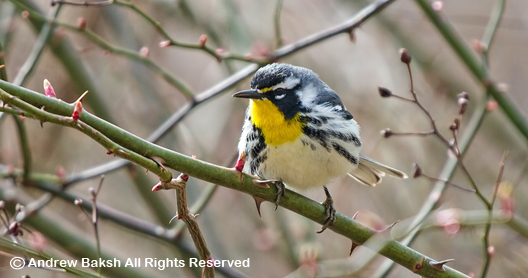 Many birders get weak at the knees for warblers or some specialty bird. Me, I am my happiest when surrounded by shorebirds. It does not matter if they are all Semipalmated Sandpipers or any of our other common shorebirds, I just love me some shorebirds. 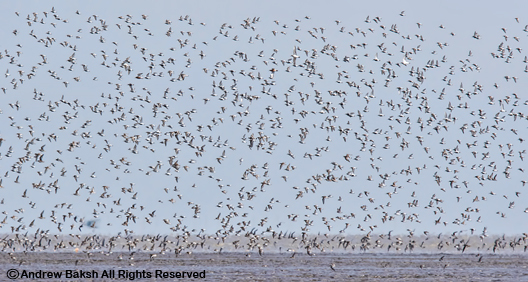 This was a mixed flock of shorebirds observed in the Jiangsu Province in China. 5. 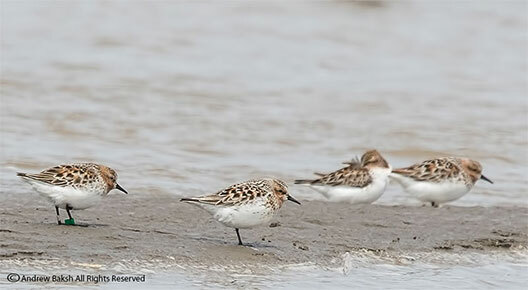 Multiple Red-necked Stints including a banded one in Jiangsu China. Seeing multiple Red-necked Stints is one thing but to see them in some semblance of breeding plumage and one with a band was something that had me grinning from ear to ear. Shorebirds are the shiznit! 4. Blue-crowned Laughing Thrush China. An endemic to China, there is a chance that additional populations may be uncovered but at the moment, this species is listed by Birdlife as critically endangered. Being able to see it made this moment a definite top 10. This was a very special one for me. Having being gripped off by my mate James Phillips from Natural England after he and his teammates saw their life Relict Gull. I was delighted that I was able to erase that deficit on 10-8-15 when I laid eyes on my own Relict Gull and not just one but two. The crippling views and equally sweet flight shots made for a good come back. When Ronald Dibgy from the UK, confirmed this was a "headstarter" bird, I was thrilled. This was my very first banded Headstarter Spoon-billed Sandpiper and I was delighted that I was able to read the flag (T8) and get adequate supporting documentation in the form of photos and videos. Headstarting, is part of the conservation breeding program for Spoon-billed Sandpipers in which specialists take eggs from incubating birds into captivity and raise the chicks by hand to fledging age in the Russian Far East, before they are released back into the wild. I could easily have used the moment of holding my first Spoon-billed Sandpiper in my hands, as I helped to band in the first ever project of its kind in Jiangsu China. Instead, I chose to use the photo and moment of seeing 01, nicknamed "monumental one," the most famous Spoon-billed Sandpiper of them all. The one whose lineage is mostly responsible for this species making a comeback (I am optimistic). I had all but given up seeing this bird and there were days when I logged up to 10 KM on the flats not just looking for this one in particular but always hoping. When I finally set my eyes on 01 in Yankou China, my heart was pounding so much, I could not keep my hands steady until I calmed myself down. I was so giddy with excitement, one would have thought I was a little boy with his first love. Indeed, shorebirds are my first love and this fella made all the work and sacrifices worthwhile and deserves to be number ONE on my top ten list. So there you have it, my Top Ten birding moments of 2015 and what a year it was. I am going to be hard pressed to beat that in 2016 but I am of to a good start with a fantastic run of good birds in New York and it is only January 4th. A good year of birding is always best when you achieve goals and see good birds. However, in addition to the birds, there is the people experience and I am VERY lucky to have a small but excellent group of people who play an important role in my North American birding. In no order I can't say thank you enough to Tom Burke, Gail Benson, Shai Mitra, Particia Lindsay, Doug Futuyma, Steve Walter, Joan Quinlan, Joe Giunta, Eric Miller and all the other people (too many to list) who tolerate my company. My non NA peeps--Jamieboy, AdamdaGrettonator, Nigel Clarke, Guy Anderson, Professor Chang, Professor Ma, Hebo Peng, Miao, Anna Zhang, Zhang Lin, Jing Li and David Melville. Thank you for your friendship--I think you know how much I value each and everyone of you! Happy New Year to all my readers and thank you for staying faithful.